Produced in the days immediately after WWII, Roberto Rossellini’s Rome, Open City is primarily fictional, yet because it was shot on-location and features a number of non-professionals in the cast, the movie also conveys an authenticity that results in an almost documentary feel. The story is set during the latter days of the war, a time when the Nazis were actively pursuing members of the Italian resistance. The area’s Gestapo officer, Major Bergman (Harry Feist), has set his sights on apprehending local engineer Giorgio Manfredi (Marcello Pagliero), a well-known leader of the rebel movement. Finding him, however, may prove difficult, seeing as Manfredi has many friends who are willing to hide him, including Francesco (Francesco Grandjacquet) and Pina (Anna Magnani), a young couple engaged to be married, and Father Don Pietro (Aldo Fabrizi), a catholic priest secretly working for the resistance. Together, these three do what they can to keep Manfredi safe, but in a city torn apart by war, information is a valuable commodity, and if Bergman can’t locate Manfredi on his own, he might find someone who, for a price, will gladly point him in the right direction. The gritty sense of realism that Rossellini brings to the film owes a lot to the city of Rome itself, its desolate streets and cramped apartments serving as a sad reminder that the opulent glory of its past was but a distant memory. As for the performances, two stand out; Anna Magnani is wonderful as Pina, the fiancé and mother (she has a young son named Marcello, played by Vito Annicchiarico) who makes the ultimate sacrifice for love, and Aldo Fabrizi shines as Father Pietro, the priest who fully believes God is on his side. The scenes involving their characters are easily the film’s most poignant. 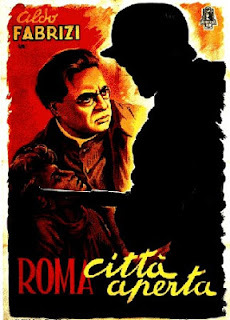 Rome, Open City was an early entry in what would become known as the Italian Neorealist movement, a style of filmmaking born more out of necessity than art. By the end of the war, the Italian motion picture industry was practically non-existent. With no studios to shoot in or money to hire professionals, filmmakers took their cameras to the streets, telling stories about the common man that, because of the circumstances, also starred the common man, people with little or no acting background. And since government officials weren’t peering over their shoulders any longer, directors were finally able to shoot pictures that reflected the world they lived in, tackling such social issues as poverty and oppression. A number of talented individuals would come into their own during this period, including Federico Fellini, Luchino Visconti (whose 1942 movie, Ossessione, is considered the first true Neorealist work), and Vittorio De Sica (Shoeshine, Bicycle Thieves). And, of course, Roberto Rossellini, who, with movies like Rome, Open City, brought a reality to the screen the likes of which cinema fans had never seen before. Another one I haven't seen, but which I now will seek out thanks to your blog! Thanks! James: It's a great example of Italian Neo-Realism, and a very dramatic movie to boot. Enjoy!